During a visit to the Normandy, we were paying our respects at a British Army cemetery when we were approached by Brian, who recognised the insignia shown on our group t shirts. 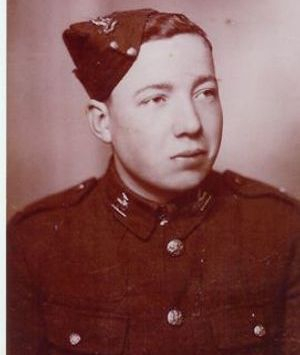 He explained that his Uncle had served with 2nd Battalion and has kindly allowed us to share his story, as written by Brian. 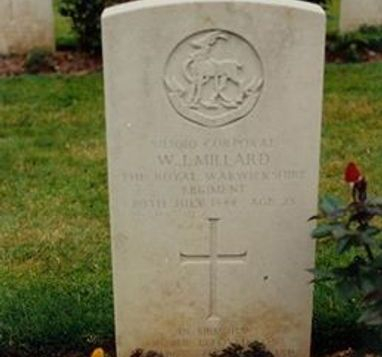 "This is a photo of my dad’s brother William Jack Millard who is remembered on Darlaston Cenotaph. Jack joined up on the day war was declared and joined the 2nd Battalion Royal Wawickshire Regiment. He served with the B. E. F being evacuated from Dunkirk on the 30 May 1940. He returned to France on D day landing on Sword Beach. I found an account of how he died in a book written about the regiment that I bought from the museum at Warwick. I quote. ”There were several gallant acts during this period. The next day, for example, B Company was losing men to a German machine- gunner firing from close range from Emieville, the village just beyond Cuillerville Wood. Corporal W. J. Millard crawled toward the enemy Spandau with his Bren gun, then got up and rushed it, firing from the hip. He killed two of the enemy, only to be mortally wounded himself. The next day the Germans had left Emieville unoccupied”. Jack is buried with his mates either side of him, at Ranville cemetery. Just outside Caen not far from where he fell."